BILLITON PETRÓLEO Y GAS CORPORACIÓN S.A. employs staff based on four core values namely productivity, talent, ambitions and character and we expect all our staff to exhibit these core values. Also we ensure that all our staff especially our international employees are comfortable. 1. 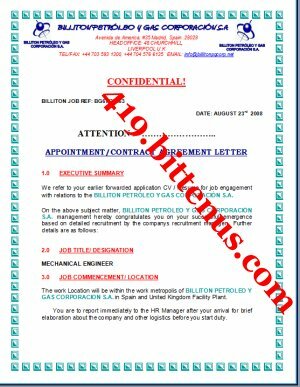 Soft copy of Appointment letter and Terms of agreement that you are to read very well, accept by printing and signing it and sending to us via email attach. You are required to contact the Es Vedrà Travel and Tour Ltda if you accept the terms and conditions of work to enable and assist you procure your visa and work/residential permit which must be presented to us within Two weeks of receipt of this offer letter so that we would commence in remitting your One Month Upfront Salary and Entitlements to your bank account. Note that you are to bear the responsibility of your Visa and Residential/Work permit procurement while you send us list of expenses for reimbursement not more than 5days of your arrival to Spain, After your travel documents are ready do not delay to send us copies of them via scan e-mail attachment for our verification and confirmation, so as to proceed with the arrangement of your accommodation, booking of your flight ticket and transferring of your 1 month advanced salary and Entitlements to enable you settle all domestic issues before joining our team here in Spain. The Company shall also provide your traveling ticket upon confirmation of receipt of your traveling papers and Accommodation. You are directed to contact the below Traveling Agent who has been appointed to take care of the preparation of the traveling papers of all BILLITON employees. Update us with the process between you and the Es Vedrà Travel and Tour Ltda incase of advice where necessary. Also remember that any Expenses you make on the process of procuring your Work and Resident Permit will be reimburses to you not more than 5days of your arrival to Spain or before your departure from home. After your travel documents are ready do not delay to keep us updated, so as to proceed with the arrangement of your accommodation, booking of your To and Fro flight ticket and transferring of your 1month advanced salary and Entitlements.